Checking your pair's nest may help you to better manage the breeding of your birds, but it is also a very disruptive activity and not all pairs will tolerate it. This article explains the reasons nest checks are performed, tips and advice for performing nest checks, and warnings about when to hold off on checking the nest. I personally feel that checking a pair's nest helps me to monitor the pair for problems that I could intervene with. I also like to collect certain data that may help me to manage the breeding of my birds by assessing their productivity, fertility, the vigor of the chicks they produce, and their parental skills. The following list contains information I personally like to gather if possible. Not all of the information below is essential to know, so do not feel obligated to check for everything listed, since nest intrusions should be minimized. The date the first egg is laid. This not only indicates the start of a clutch, but it also provides some information as to paternity of the egg(s) if the pair was recently pulled from a mixed flight and placed in an individual breeding cage. Because mated hens can store sperm in their reproductive tract for up to about 16 days, it is possible that another male fertilized the egg(s) if the first egg was laid within 16 days of placing the pair in their own enclosure. The total number of eggs laid. Knowing this number will help you to keep track of the productivity of your pair, will give you an indication of the maximum number of chicks which may hatch, and will allow you to know if any eggs "disappear" later (if a pair laid 5 eggs, but you find 4 eggs a few days later, you know that something happened to one of the eggs). The date incubation begins. This is perhaps the single most important piece of data you can gather, and it does not require looking into the nest. Simply observe the pair from afar and note the first date that at least one bird is occupying the nest during the day as well as at night. Knowing this date will help you to estimate when the eggs can be candled for fertility (they must be incubated for at least 5 days before you can candle them), and when the eggs (if fertile) should begin to hatch. The calculated hatch date can be found if you know the average incubation length for the species you are breeding. 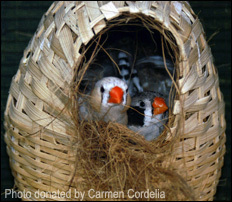 For example, society finches have an incubation length of 16 days. If a pair of societies begins incubation on April 1st, you would expect fertile eggs to begin hatching around April 16th. The calculated hatch date is an important time to monitor the floor of the cage in case any babies are tossed and need rescuing. I personally begin monitoring the floor of the enclosure 2-3 days before my calculated hatch date to account for any error in my assessment of when I thought incubation began. I do not "give up" on a fertile clutch until about 7 days* after my calculated hatch date at which point I presume any chicks which developed died within the shell. *If candling the clutch a second time closer to the hatch date shows obvious signs of embryonic death, you do not need to wait to discard the eggs. The fertility status of the clutch. Fertility of a clutch is determined by candling the eggs at least 5 days after the start of incubation date. This helps you to ascertain fertility of your pair, and allows you to know whether or not any chicks can be expected, and about how many you can expect. If all the eggs are "clear" after candling on day 5 of incubation and again a few days later, you can investigate and try to correct the cause, as well as discard of the clutch and allow the pair to start over if they have not already met the limit of 3 clutches for the year. The actual hatch dates of each chick. This can give you feedback about the length of incubation if you are confident in your 'start of incubation date,' or it can indicate if you were accurate picking the start of incubation date if the length of incubation for the species is already known. The actual hatch date also gives a "birth date" to each baby, which will allow you to accurately assess the age of each chick and to see if growth and development are occurring normally, as well as calculate an expected fledge date and wean date. The survivability of the chicks. Chick deaths are very important to note, since the cause (if not due to trauma/tossing) could indicate a problem with the health of the birds. Infectious agents can kill chicks and these need to be addressed and corrected if possible. The development of chicks in the nest. Periodically checking on the young in the nest will indicate if they are being fed as well as if they are growing normally, or if they seem sick and in need of veterinary intervention. Monitoring the growth of the chicks also allows you to chose an appropriate time to band the chicks, if you wish to close band them. Some finches will tolerate occasional nest inspections, with some pairs tolerating nest checks better than others. Generally, the more domesticated the species, the more tolerant they tend to be. Zebras and society finches, for instance, usually allow nest inspections, while other more nervous species are better off left alone. If you have had a pair abandon their nest and eggs or chicks in the past, you should probably not risk nest inspections with that pair in the future. That stated, occasional nest checks, when done correctly, can help you gain information about the status of the eggs and any young. 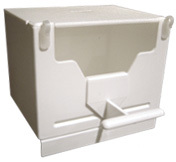 If you have set up the breeding cage with an external nest box that has a hinged top, you will be able to perform the easiest and least intrusive nest checks. Nests placed inside of the enclosure are more difficult to get to, so use your best judgment about whether or not inspecting those nests is worth risking the pair abandoning their eggs or chicks. Using a compact mirror or a laryngeal mirror (the type dentists use to look at your teeth) with a pen light attached may help you to see what is occurring inside the nest. Ideally, you should only inspect a nest when both of the birds are outside of it. Hopefully the nest is eye level to you so that you can simply peer inside to see if eggs have been laid yet, and if so, how many have been laid. Try to avoid the temptation of hovering about a breeding pair's cage. The more privacy you can give your birds, the better. I recommend glancing into the nest from a distance (if possible) once per day while you are providing the birds with fresh food and water. Record the dates that you see each egg laid and record the date that you notice the pair begin incubation. If you need to reach into the nest for any reason (such as candling eggs for fertility), make sure to wash your hands first, to be very gentle with the eggs and any young, and to make the nest check as brief as possible. Using a special egg candler or a very small flashlight may help you to check the fertility of the eggs without removing them from the nest. Any time eggs or young are removed from the nest, there is a risk that damage to the egg or injury to the chick(s) may occur, so try to minimize handling of the eggs and young as much as possible. Finches, especially breeding finches, should not be disturbed unnecessarily. Hovering about and tampering with their nest makes most finches very nervous and my cause them to abandon their eggs and/or chicks. Do not perform nest checks if this is your birds' first clutch or if your birds have a tendency to abandon their eggs or young upon being disturbed. If your pair will not tolerate nest inspections, simply do not attempt them. Remember that birds have been raising young for millennia without human intervention. Watching your pair from afar will give you some idea of when incubation has commenced. Knowing the incubation length for the species you are breeding will give you an idea of when to expect chicks to start hatching, if you assume some of the eggs are fertile. Begin scanning the floor of the enclosure for tossed or fallen babies a few days before your calculated hatch date, and continue monitoring the floor for several days after the calculated hatch date. Newly hatched chicks do not beg audibly and usually are not given their first meal until they are 2-3 days old. You may begin to hear begging noises around this time (when the chicks are about 3 days old). Therefore, by simply watching your birds from afar and listening for begging noises, you will be able to know some details about the status of your pair's clutch. If you are going to close band the chicks, you can do so after they are about 8-10 days old, but before they fledge the nest. Once the chicks have fledged, you can take the nest out and look inside it to see if any eggs were left unhatched, and you can candle these eggs to see if they had developed at all. Doing this is less disruptive to your pair, and may still give you some valuable information about the fertility and productivity of your birds. If 7 days have passed since the calculated hatch date, and you have not heard any begging noises or found any fallen chicks, peek inside the nest to see if any young are present. If not, candle the eggs. If they are minimally developed or completely clear, you may discard of the clutch and allow the pair to start over if they have not already had 3 clutches.